Ranked 359 in the Internet Retailer 500, and boasting over 45,000 products in its catalog and 151,000 pages in Google, Beach Audio has a lot of grunt. According to Troy McKinnon, their director of ecommerce, Beach Audio did a complete search engine optimization overhaul using in-house staff in April, and ever since, the search-generated sales have been rising steadily. Currently, organic search from Google accounts for about 10 percent of website sales, and the outlook continues to look good, especially with the holidays and their peak season right around the corner. Nonetheless, I see a lot of unrealized potential here. So let’s dig in. But let me direct you back to the 151,000 figure I mentioned in the first paragraph. This initially healthy looking number is inflated by duplicate pages and throwaway pages. Duplicate content is undesirable, as I have previously mentioned. And when I say throwaway pages, I mean pages that have minimal content (such as review submission forms) and/or error messages (such as “Reviews are temporarily unavailable while we upgrade to a more powerful reviews system! Please check back soon.”). I recommend blocking such duplicates and throwaway pages by disallowing within robots.txt all URLs containing reviewsubmission.php, productreviews_write.php goto.php, etc. Furthermore, stop passing link juice to such pages by including rel=nofollow in the links pointing to these pages. Strategically passing link juice within the site is an underutilized SEO secret. I was impressed to see Beach Audio employing this to a limited degree. Specifically, some of the navigation links have been nofollowed (e.g. Order Status, Customer Help Center, Testimonials, Email Us, Check Shopping Cart, My Account, FAQ, About Us, Shipping Info), but this has been done inconsistently (e.g. in the page footer, Order Status and Customer Help Center are both missing the nofollow). There is link juice going to pages that are not strategically important, such as the Hacker Safe verify page and the latest product reviews. There are no overarching keyword themes on the home page with the exception of the company name. Consider for example: audio equipment, home audio, car audio, car stereos. Targeted keywords for the home page are all over the place, if the meta keywords are any indication. Title tags could be improved across the site. 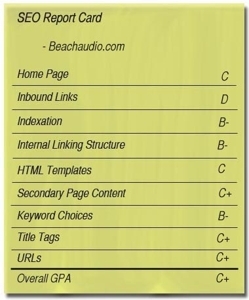 Title tags either start or end with “Beach Audio.” Putting that at the end is better than at the start, but best of all would be to remove it altogether to tighten up the keyword focus. Also remove the list of model numbers from title tags on category pages. Write handcrafted title tags for all category pages and for product pages of all top sellers. Work in popular synonyms, singular/plural forms, and maybe even misspellings. For example, change the title tag on the Amplifiers page from the current, overly-long “Car Audio / Amplifiers [pla2180,plv2,a2400db,a3000db,pt600a,ksar7002,ksar7001,and more!] : Beach Audio” to something like “Car Amplifiers/Amps.” (Note that keyword research reveals “car amplifiers” as much more popular with searchers than “audio amplifiers” or “car audio amplifiers,” which was the reason why I removed the word “Audio” as the second word of the title tag, to incorporate the more popular phrase into the title).